Ever since the start of the Adventurous April Knitalongs I've been spending every minute I could manage knitting. So I've made good progress on each of my projects although I haven't been blogging. The first project I want to share is Citron, with more to come later this week. If you've never done a garter tab start to a shawl before, it can be a bit intimidating. You have to think about it right: to make the start look like a semi-circle, you will cast on a few stitches and knit for a few rows before picking up stitches along the edges to get your shawl off to the right start. Don't be afraid to stick your needle into any available space between the stitches as long as you're consistent. Doing several swatches to see what approach you like best is a life skill! I've made it through two repeats and am pleased with the colors and the drape, so on we go. 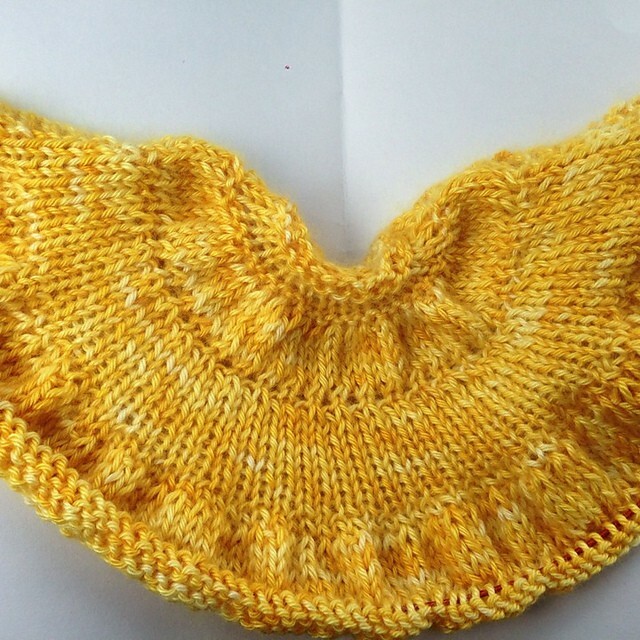 The yarn is Elliebelly Moth & Goat, a blend of silk and cashmere that has just the right drape for Citron. Although I didn't think about it in advance, the yellow color makes the shawl in progress look like a big slice of lemon!